Dental implants have led the way in restorative dentistry when compared to alternative tooth loss solutions. This treatment can replace a single tooth, multiple teeth or a complete full arch. Moulded to each individual patient, this dental solution can create a smile makeover that is unique to you. Implants are made of titanium alloy and a small screw is inserted into the jaw bone, making a bond to bone! Dental implants are more than just a fixed solution, problems with speech and or eating are completely eliminated. Once your mouth has fully healed from the initial implant treatment, dental implants should feel as well as resemble natural teeth. Dental implants are the closest replacement and imitation to natural teeh, as well as the most permanent and sustainable dental solution. At the Brighton Implant Clinic, patient satisfaction is at the forefront of our clinics and thats why we provide. Following the success of Dr. Silva’s first branch in Hove, East Sussex, the Brighton Implant Clinic now spans over 4 sites in the South East of England. 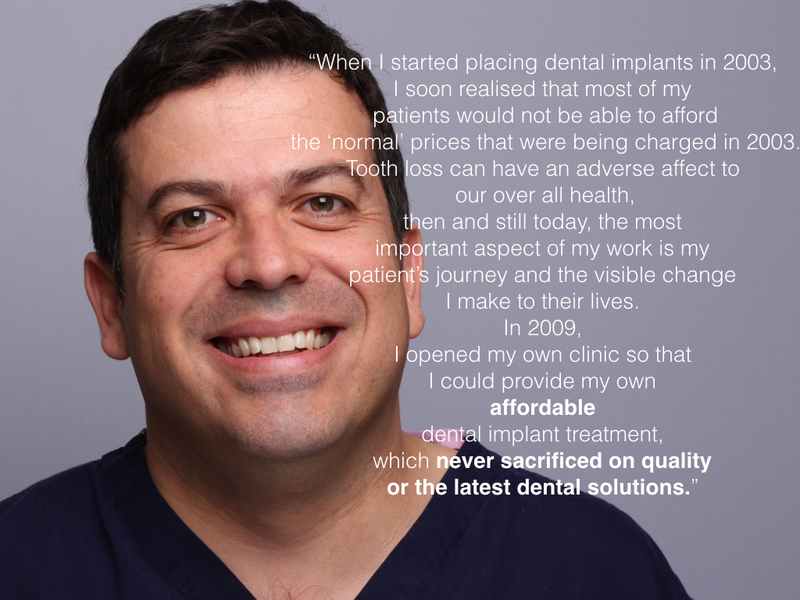 Dr. Silva’s work ethos for innovative as well as affordable dental implant treatment has become renowned within the UK as well as Europe! 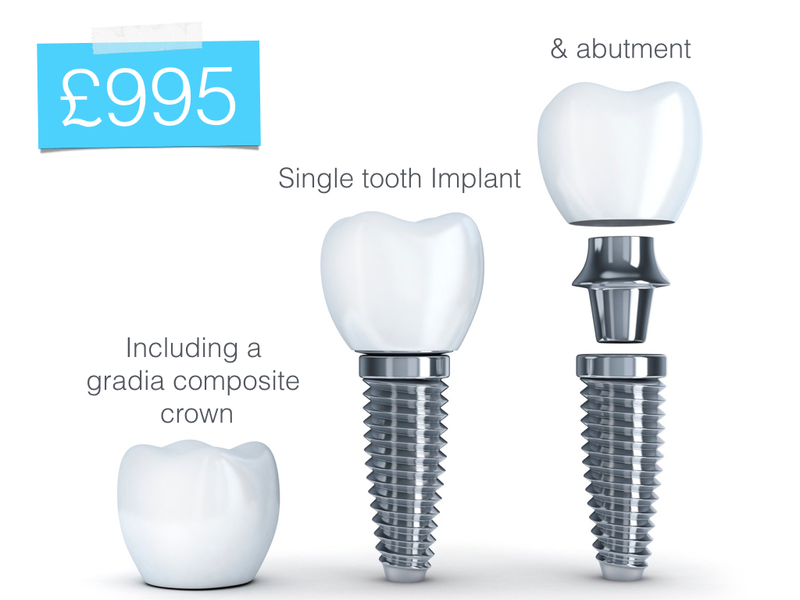 Looking for cheap dental implants? How about affordable! 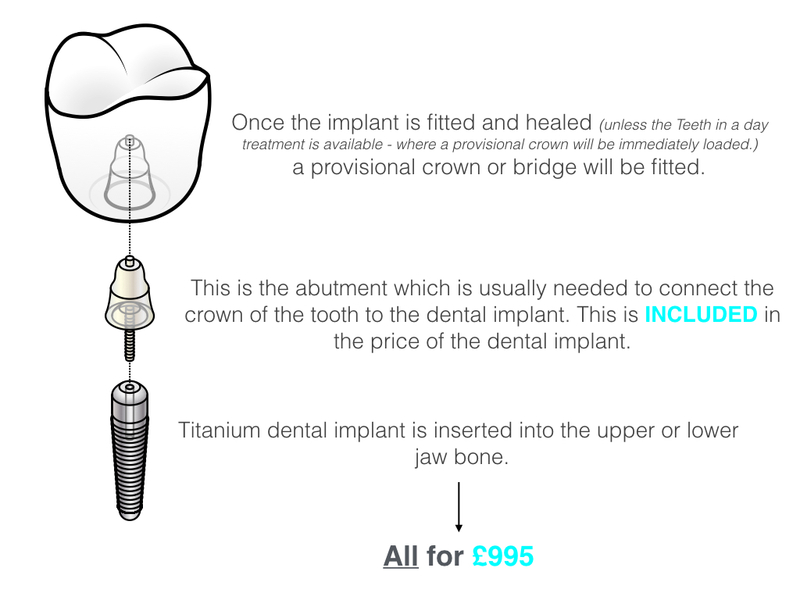 The average cost for dental implant treatment in the UK usually ranges from £2500.00 – £3000.00. At the Brighton Implant Clinics, our treatment starts from £995.00. Our first implant assessment is free. We provide a free one-hour consultation with an experienced and qualified dentist in dental implant treatment. In this consultation, the dentist can give you a free panoramic radiography, which will enable us to have a look at your teeth and jawbone structure to answer any queries. This will also let you and your dentist begin a treatment plan and decide whether this treatment will be right for you. At our clinics, we have an Onsite CT scanner. This allows our dentists to provide accurate information about patient’s dental health or suitability for dental implant treatment. With this facility within our own clinic, there is no need to refer you for a CT scan. We have an onsite dental laboratory which works alongside the clinic, our talented lab technicians manufacture crowns, and bridges for dental implants. This in-house facility enables dentists and technicians to work together with patients to get desired results at no extra cost. As our clinics only have innovative as well as the best dental implant solutions, we only buy high-quality products which are FDA approved and CE marked. Dr. Bruno Silva has been placing dental implants since 2003! There are different types of dental implants, whether that be, a single tooth implant or an implant supported bridge. At the Brighton Implant clinic, we provide both and with new procedures in dental implant treatments this means that a fixed tooth solution can be available in just one day! This is also known as teeth in a day. If you suffer from multiple tooth loss, an implant-supported bridge may be better suited for you. This can be using just four implants for a complete lower or upper restoration. This procedure is known as all on four. Our dental implants are made from titanium which can create a strong bond to bone, this process is called osseointegration. The process of osseointegration meaning bone connection is where the jaw bone attaches itself directly to the implant, growing around and supporting it. This usually takes a few months to occur and is similar to how the root of a natural tooth is embedded in the jaw bone. Dr. Silva advises that the procedure of inserting a single dental implant takes approximately one hour and for multiple implants or for the all on four dental implant treatment, surgery can take 3 to 4 hours. Patients have the choice between local anaesthetic (numbing injection in the mouth, similar to when having a filling) or an intravenous sedative (being put to sleep). In this modern day, everything has become more accessible, be that information, technology or travel. With this, this enables people the option to widen their search to see if treatment may be more cost-effective overseas. If you are considering traveling overseas, there is a lot of factors to consider such as weighing up additional costs of travel, accommodation, flights as well as the actual treatment. You should also take note of the different laws and statutory requirements, as they can be different in each country. 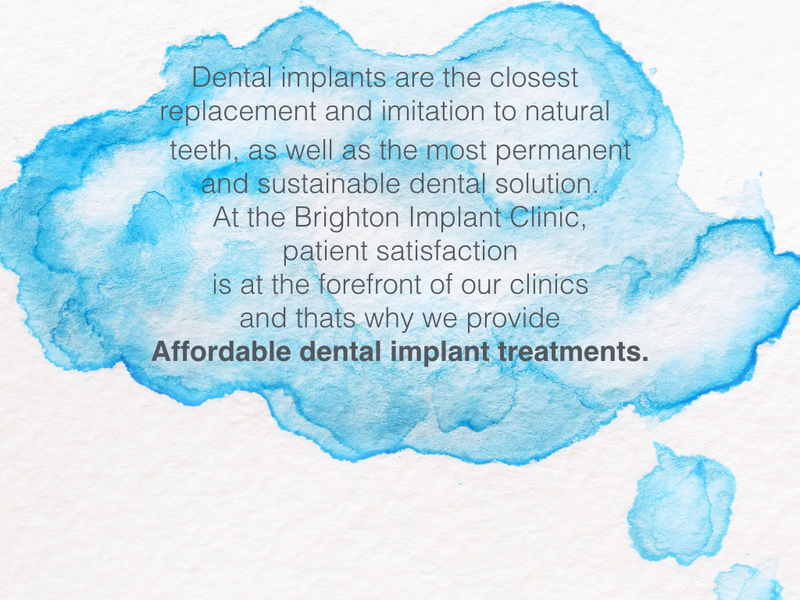 At The Brighton Implant clinics, we pride ourselves on not only being a centre of excellence but also offering affordable dental implant treatments here in the UK. For more information, you can book in a free consolation with us or live chat with us now. Did you Know? That is has been scientifically proven that smiling and laughing is beneficial to our health and well-being. This is through feel – good endorphins being released in our brain when we smile. The Brighton Implant clinics are based in Brighton, Hove, Hailsham, and Worthing. Our clinics are fully equipped with the latest technology in the field of Oral & Maxillofacial surgery, managed by our team of highly qualified dentists, surgeons, nurses and dental technicians. We want to be with you every step of the way, therefore we have a development and treatment management plan which is individual to every patient. Today, we see many patients coming from different parts of the UK as well as Europe for our dental solutions. This is why we offer accommodation packages for patients travelling long distances. Patient treatment and satisfaction are at the forefront of our clinics, and we try to accommodate to each one of our patient’s individual needs. If you would like any further information visit our full website. Each individual patient is different and our price list is a detailed breakdown of what a patient may want as well as may need. We offer a free consultation for dental implant treatments.